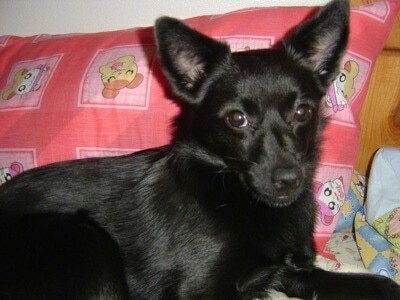 "This is a picture of my 15-month-old female Schipperke / Maltese mix named Roxy. She is 12 inches at the shoulder and weighs 16 lbs. She is more Schipperke than Maltese!!! The only Maltese part she has is her fluffy tail, which was not docked when she was born, and a very small white patch of fur on her chest, making her a very unique Schipperke mix. She is my first pet and I think she is the best dog I could have asked for. She loves to run around the house and is really great with children. However, she does not like to share any of her toys or treats with any other dogs. She is very protective over the house and always barks when we get a visitor. She especially barks like crazy when she looks out the window and sees squirrels running around in our yard. She chases rabbits and squirrels in our backyard. She was very easy to housebreak and obedience train as well. She is a very independent dog and all of her personality traits come from the Schipperke breed. When I get another dog, I definitely want to stick to the Schipperke breed." The Schipese is not a purebred dog. It is a cross between the Maltese and the Schipperke. The best way to determine the temperament of a mixed breed is to look up all breeds in the cross and know you can get any combination of any of the characteristics found in either breed. Not all of these designer hybrid dogs being bred are 50% purebred to 50% purebred. It is very common for breeders to breed multi-generation crosses. 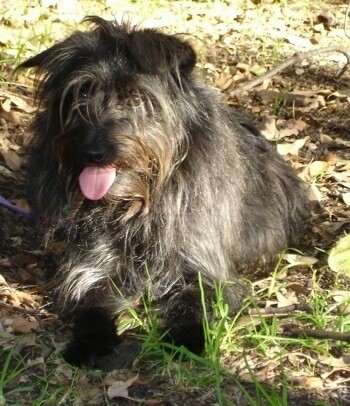 "This is our Schipperke x Maltese hybrid Kenny, shown here at 2.5 years old. Kenny is certainly a character. He’s a little dog with a big dog attitude. His dad was a Schipperke and his mother a Maltese. Very cheeky, but very loyal and affectionate. Loves his walks, but a little crazy when taken off the leash!!! Loves to chase birds and soak in the dirtiest puddle he can find! He’s very protective and will certainly let us know if anyone is approaching our house. He loves to run laps and is extremely fast; we can’t ever catch him! He’s a wonderful addition to our little family. Very intelligent. Loves training but isn't always consistent with his obedience. We find that we can’t let him ‘take an inch’. However, he’s fantastic with kids and enjoys their company greatly! He can be a fussy eater. Some days he will eat anything and then other days, he is quite happy to have very little. Kenny is longhaired...lots of the kids think he’s “Hairy McClary” (a favourite children’s book character from New Zealand, popular in Australia too!). We have never come across another Schipperke x Maltese...so he’s even a little more special to us!!!"